We went creeking today, for the first time since last year. It feels like the real start to summer. My boys turn into little wild water creatures who won’t wear shoes or shirts for the rest of the summer. Malcolm bounds through the water and leaps off the rocks. Isaac picks his way gingerly across, bobbing through light and shadow, deep and shallow. They glow in the sunshine, as smooth and warm as river rocks. Today we saw a spider the size of a small mouse scamper across the water, carrying dozens of baby spiders on her back. And my boys hop after speckled toads – much smaller than the spiders, who blink their golden eyes at you from between my boys’ fingers. With the start of summer comes the start of summer eating, and my ideal meal in the summer is a big mix of vegetables, prepared different ways, some cool, some warm. Salads, beans, potatoes, olives, cheeses, maybe a sauce or two. And something to eat everything with. Some bread or crepe to tuck everything inside. 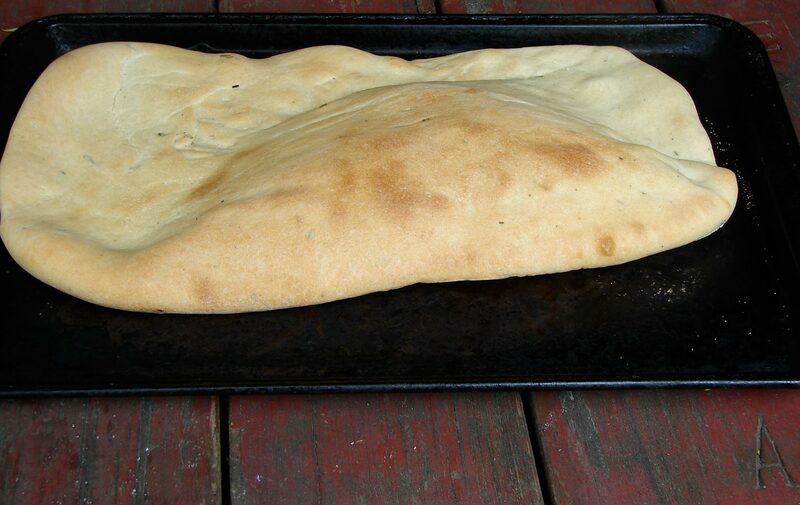 Like this giant rosemary flatbread! It’s quite chewy and crusty (from the milk, I think) which makes it idea to sop up tomato, basil and olive oil, or the sauce from nicely seasoned greens and beans. You could make smaller shapes, if you liked, but I got a kick out of making two big pieces, almost the size of my cookie sheets. Parts puffed, parts didn’t, but even the parts that didn’t could be pulled apart and stuffed with yummy things. I kneaded rosemary into mine, because it went nicely with everything else I was making, but you could easily add any other herb, or sesame seeds, or caraway seeds. Here’s Booker T and the MGs to cool you off with Summertime. Dissolve the yeast and sugar in the warm water. Let sit for about 10 minutes till it gets foamy. Meanwhile, scald the milk in a small pan, and melt the butter in it. Set it aside to cool. In a large bowl, combine the flour, salt, pepper, and rosemary. Make a well in the center and add the milk, butter, and yeasted water. Stir until everything is incorporated, and you have a gravely consistency. Add just enough water to pull it all together in a kneadable dough. Knead for about ten minutes. Roll it in a large bowl with a drop of olive oil in it. Cover with a damp cloth and set somewhere warm to rise for about two hours – till doubled in size. Fold it over onto itself a few times, reform into a ball, and let it sit for another hour. Divide it into as many pieces as you’d like to make. (I made two) and let it sit for another 15 minutes. Then roll it out quite thin. 1/3 inch maybe. Mine were about 8 inches by 16 inches. I set them on dry cutting boards to rest. Preheat the oven to 450, and put your baking sheets in to preheat as well. I sprinkled some cornmeal on mine. When the oven is preaheated, carefully move your dough to the hot sheet. Let it cook till puffed and starting to brown on top. About 15 – 20 minutes should do it!! 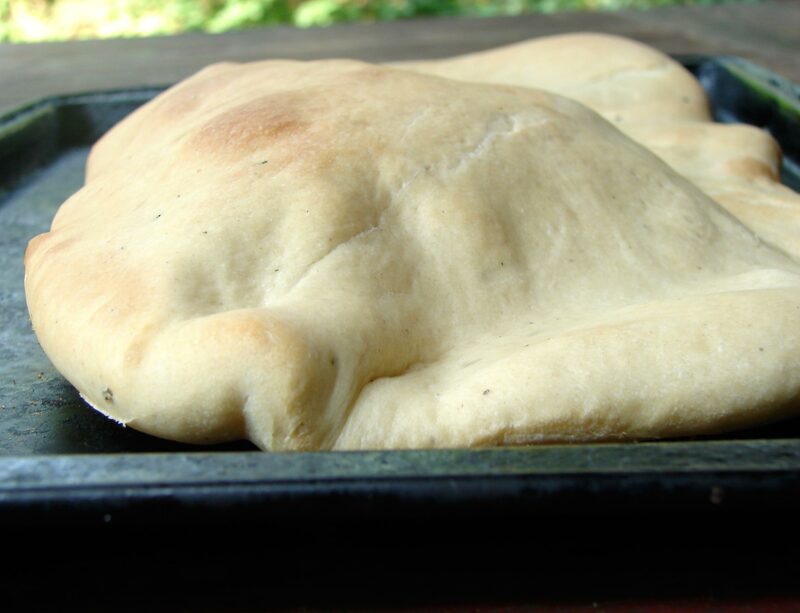 This entry was posted in bread, recipe and tagged flat bread, giant flatbread, pita, puffy bread, rosemary, summer eating by Claire. Bookmark the permalink.